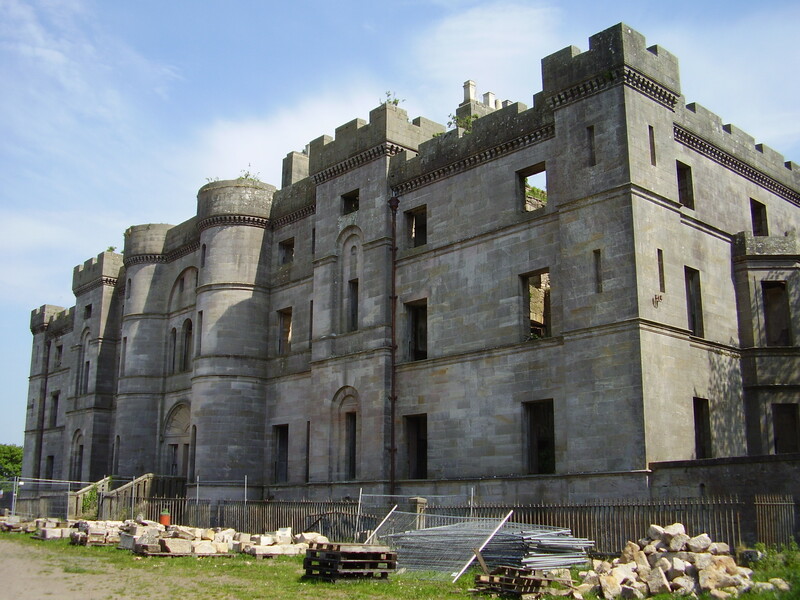 Kennedy Castles and other Homes in Ayrshire - another One-Day Tour! 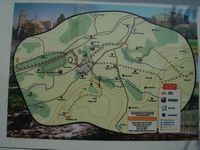 For my second tour description we will go to the Water of Girvan valley and the area around Dailly village. Here it is possible to visit three old Kennedy homes in one day and pop into the friendly pub for lunch too. Like the last trip you could do this on a bike from Girvan railway station which is only three miles to the west. This time I had elderly family with me and we took a train to Newton on Ayr and picked up a hire car. Note that this trip can only be done in May!! From the centre of Ayr head out to the A77 dual carriageway and turn south towards Maybole. When you get there take the the minor B7023 road on the left, signposted Crosshill. At Crosshill take a right onto the B741 which roughly follows the Water of Girvan. Virtually everything you see has some Kennedy connection, including Carsloe and Craigoch, and Kilkerran, home to the late Sir James Fergusson. He was Keeper of the Records for Scotland and wrote a most excellent short history of the Kennedys. 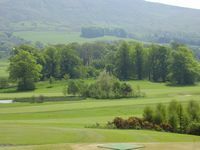 As you approach Dailly you will see a glimpse of Dalquharran on the hill to your right. We headed on through the village about 2 miles to where you will see a marked entrance to Bargany gardens, which are open to the public each May. Bargany House is private but the gardens are open each May. Bargany long ago passed out of Kennedy hands but was at one time a major branch of the Kennedy family. The estate is now owned by Mr. John Hamilton. The old castle is no longer to be seen and the mansion house pictured above was built in 1681. Please respect the privacy of the family if visiting. The gardens and woods are a splendid sight. After leaving Bargany, head back along the road into Dailly village. Outside the pub beside the churchyard is a helpful sign showing all the local attractions. Drive or walk over the road bridge over the river and turn immediately left into 'Brunston Castle golf course'. Here I spoke to a man in the shop who was not that informed about the castle. The remains are now surrounded by the golf course itself but contrary to what he told me, they can actually be seen from the clubhouse, such as they are - zoom lens or binoculars are recommended though! They can be seen close-up if you walk out onto the course although this was not encouraged. The ruins of Brunston castle amongst the trees on Brunston golf course, viewed from the clubhouse. 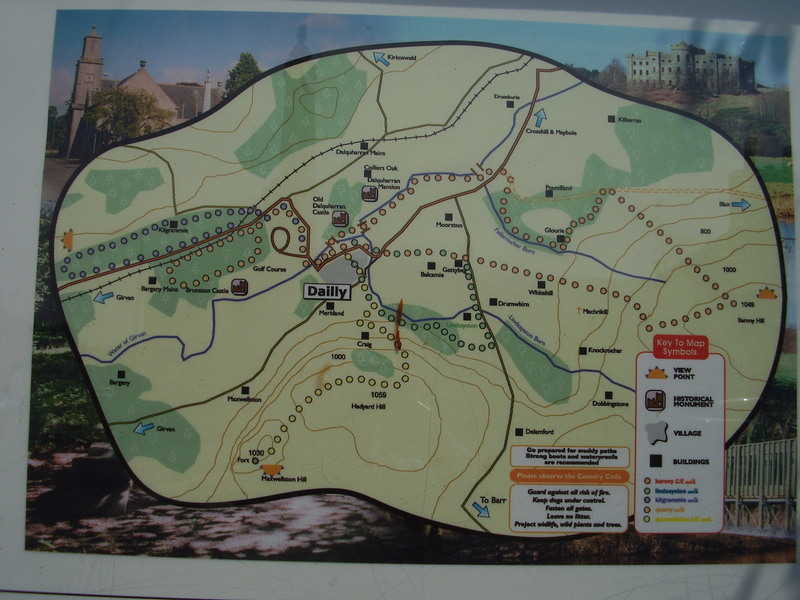 Dailly village has a good map showing all the places referred to on this page. If you find Brunston disappointing, Dalquharran more than makes up for it. 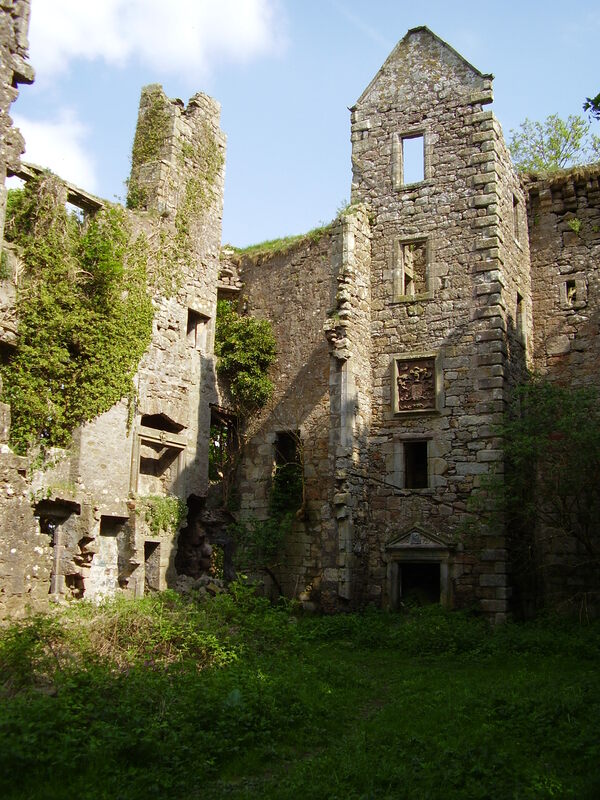 This castle and house was owned by the Kennedys of Dunure, immortalized in the book 'Seven sons of the Provost'. It was held by them well into the 20th century. 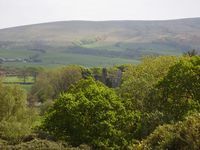 The castle is in ruins, albeit more of them and easier to see than Brunston; the mansion house on the hill was built later and is currently locked up in preparation for ... another golf course!!. We first drove up past Brunston and down the track to the mansion house, were we met the very helpful security man who told us all about the place and took my picture. 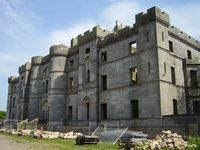 If the design looks rather familiar, that's probably because it was designed by Robert Adam, who also designed Culzean. His sister Jane married Thomas Kennedy of Dunure. Dalquharran mansion house undergoing rennovation. Dalquharran castle viewed from the mansion house. Return to Dailly village and take the path by the river directly opposite the school. This takes you over a foot bridge into the woods. Along the path you will see a raised area, walk up and you will see the burial ground of the Dalquharran Kennedys. These gravestones date back to Thomas Kennedy of Dunure who was born in 1759. Carrying on a bit further into the woods and you come to the remaining ruins of Dalquharran castle itself. 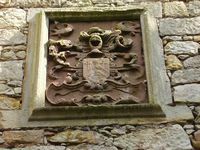 One stone bears the date 1679 and there is a family arms over one of the doorways. 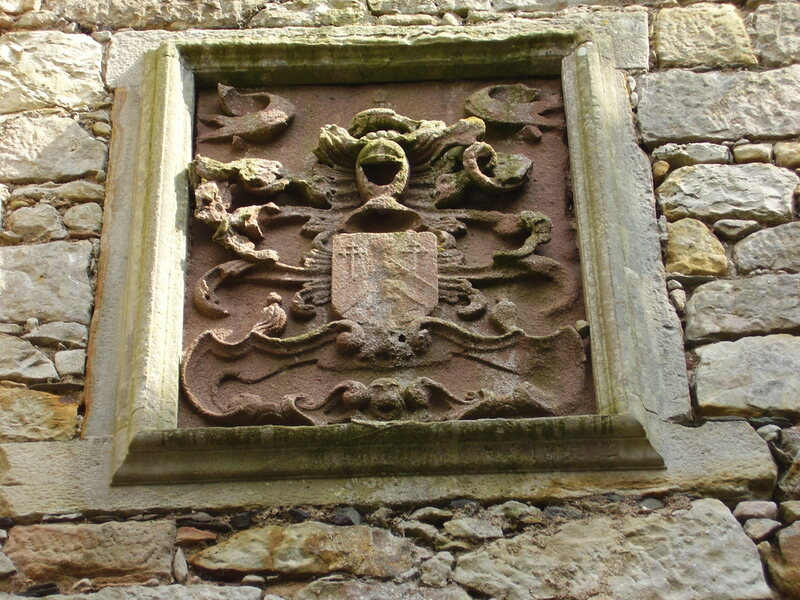 The arms of Kennedy of Dunure and Dalquharran. 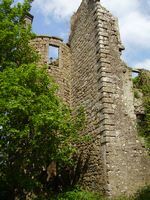 The ruins of Dalquharran castle (1). 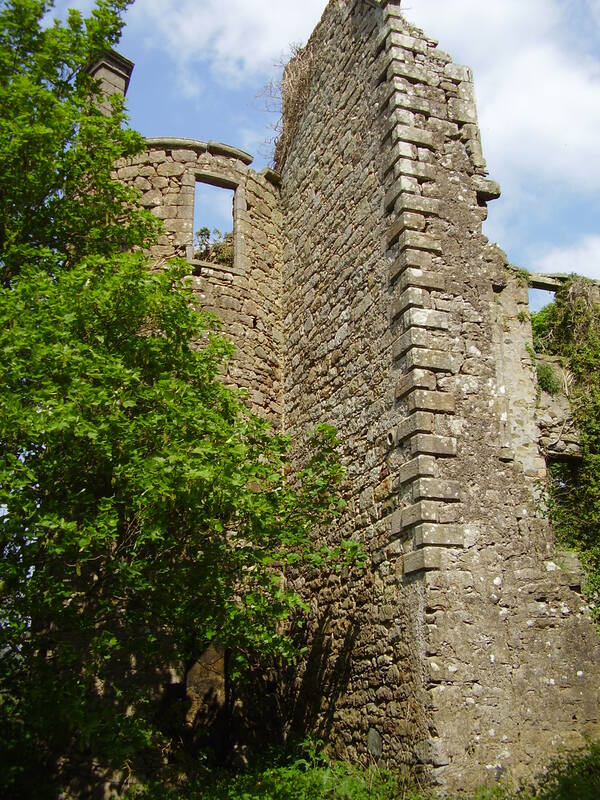 The ruins of Dalquharran castle (2).